Mu Cang Chai is famous for its terraced fields spreading out over beautiful mountain slopes, which has been recognised as a national landscape alongside Hoang Su Phi and Sa Pa.
Is a mountainous district of Yen Bai province, Mu Cang Chai located at the foot of the Hoang Lien Son Mountains and is about 300km far from Hanoi. Visitors must travel through the Khau Pha Pass – one of the most dangerous and beautiful passes of the Northwestern region to arrive in Mu Cang Chai. September is the season when the rice-terraced fields are turning yellow and are ready for harvest in the mountainous district of Mu Cang Chai, in the northern province of Yen Bai. The place has become a magnetic attraction enchanting any visitor who has ever been there during the season of grain. 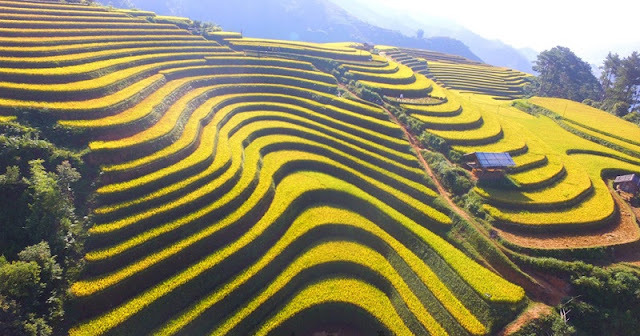 The most well-known tourist attractions in Mu Cang Chai are the terraced fields in the three communes of La Pan Tan, Che Cu Nha and Ze Xu Phinh. The locals still preserve and practice customs, rituals and beliefs related to rice cultivation on the terraced fields. In addition to admiring the stunning natural scenery, visitors can also explore the cultural identity and join the daily lives of local ethnic minority groups. 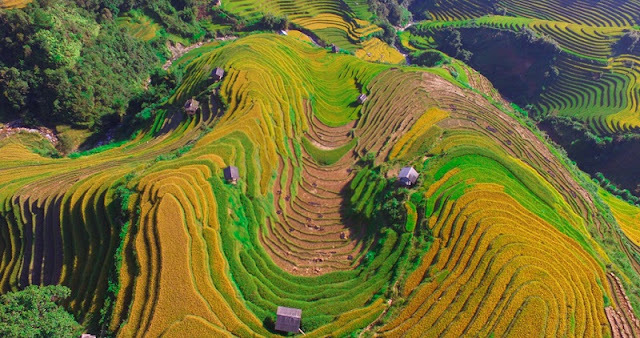 To experience a clearer experience of the culture and spectacular scenery of terraced fields in Mu Cang Chai, the homestay is a better option than a hotel. Nghia Lo is not really a must-see attraction in Yen Bai but a necessary stop for the night before going off to discover Mu Cang Chai. There are quite a number of ethnic villages that offer homestay service in Nghia Lo, one of them is Sa Ren village which is praised for its authenticity of a Thai community. Staying at Sa Ren, travelers will enjoy the experiences of living, eating, working and living in a cultural space with local people. This luxury accommodation is nested away from all the hustle and bustling life of city life. 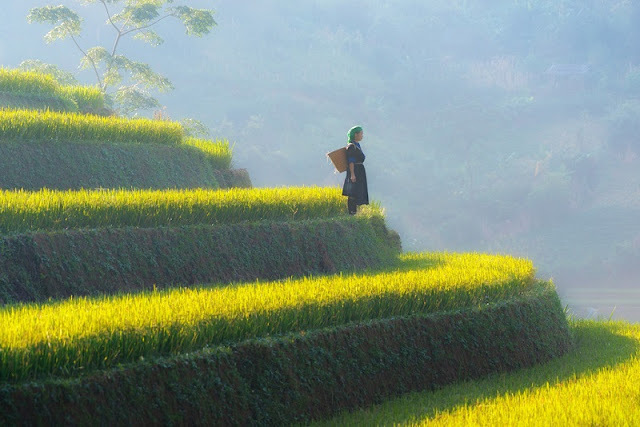 Mu Cang Chai Ecolodge is situated on a hill at Hua Khat village, and about 30 kilometers from Mu Cang Chai town, with an excellent location on a hilltop surrounded by green trees and the idyllic terraced rice fields. This ecolodge is recommended for visitors who wish to stay close to nature and enjoy the local authentic way of life. This accommodation is also ideal for couples and honeymoon vacation. Activities you can do around: trekking, riding motorbike, photo-shooting, fishing, meditating. The staff here are friendly and they do promote ecotourism by planting flowers and trees in the surrounding area, building the lodges by using local architecture and materials. Located in La Pan Tan commune, different from the luxurious look of Mu Cang Chai Ecolodge, Do Gu Homestay is a popular resting place in Mu Cang Chai. There is a spacious terrace, direct mountain views and a restaurant on site for dining. Do Gu Homestay meet your most basic needs such as eating, sleeping, personal activities. This is a stilt house with indigenous colors of Mu Cang Chai located at La Pan Tan village. From motifs of curtains, blankets, pillow covers, you will feel the very specific culture of the ethnic people here. Hello Mu Cang Chai Homestay offers free wifi garden relaxation and a children's playground. In addition, this homestay also serves a daily breakfast! From the balcony, you can watch the valleys of brushed terraced fields far away from the eyes, the rich pine forests ... with a wide staff, parking lots to ensure security and property for tourists. , reasonable price. House on stilts was built with Po Mu wood in the traditional style of modern combination of H'mong ethnic people with full facilities, fresh airy, clean.